I am highly suggestible when it comes to food. Last week my friend Nicole mentioned that she was making Beef Barley soup, and just like that, I was trying to figure out how I could get some. She looks too far away for me to beg for her to bring me a bowl, so my next best option was to make some myself. One of the things that sets a good barley soup apart from a mediocre one is the silkiness of the broth. A watery soup base that lacks flavor and texture just makes a disappointing soup. I’ve found that this happens a lot when I try to lighten up soups. By taking out much of what makes a soup taste rich and flavorful (namely the fat), the soup becomes boring. Really, really boring. I’ve been experimenting with ways to boost the texture of soups without adding a ton of fat, and have found two super star ingredients: 1) bacon (duh), 2) gelatin. If you’re looking for a vegan or vegetarian soup, this won’t help you at all. But for the rest of us, these two gems can add a lot texture without a big impact on the overall calories in the soup. In this soup, I decided to use gelatin since I planned to have a lot going on in the soup already. The gelatin’s job in this recipe is twofold: thickens up the soup and adds a silky texture. Sounds weird, but really makes a difference. Serving size: Approx 1 c.
In a small bowl, mix together boiling water and gelatin until dissolved. Pour over dried mushrooms and set aside for 30 minutes. After 30 minutes, remove mushrooms and chop finely, reserving liquid. In a bowl, mix together venison, flour and pepper spice blend until the meat is well coated. In a large pot, heat 2 T. oil over medium high heat. Add venison and cook until lightly browned. Remove meat and set aside. Add remaining oil and add onion, garlic and carrots; cook for 2-3 minutes. Add mushrooms and cook for 1-2 minutes. Add chopped porcini and venison to the pot and stir. Add reserved mushroom liquid and bring to a boil. Scrape up browned bits from the bottom. Add stock in two or three batches, scraping up all the bits from the bottom and bringing back to a boil between each. When the bottom is scraped clean and the liquid is boiling, add pearl onions and pearl barley. Bring to a boil, then reduce heat to low and cover. 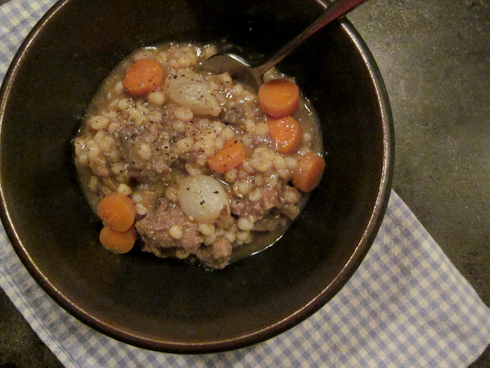 Cook for 30-45 minutes until barley is tender (should be kind of al dente). Season with salt and pepper to taste. – You could also make it without meat altogether. In that case, I’d suggest omitting 1 T. olive oil, and adding the flour/spice mixture to the vegetables after they’ve cooked a bit, but before you start adding the liquid. – I made this ahead and reheated it, and it thickened up quite a bit. In some cases, you may want to add a little broth when reheating. I enjoy reading your blog so much that I nominated you for a Versatile Blogger Award. Congrats!